We are al fresco chicken sausage Ambassadors. All views expressed are that of our own. The summer is all about grilled goodies! Who doesn’t love a piping hot meal off the grill? I know we sure do! I love when my husband grills because it means I have fewer dishes to do inside, and the meals are usually much more flavorful verses cooking indoors. 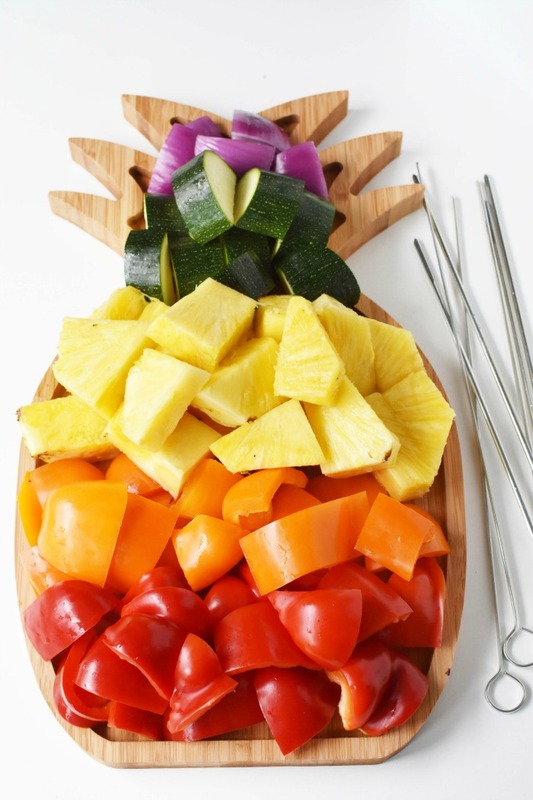 Sweet and savory is my thing so meals that feature grilled fruits & veggies are my favorites. 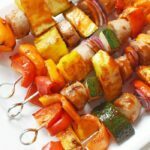 That is why these Grilled BBQ Chicken Sausage Kabobs with Pineapple and Veggies made with al fresco Chicken Sausage are amazing! 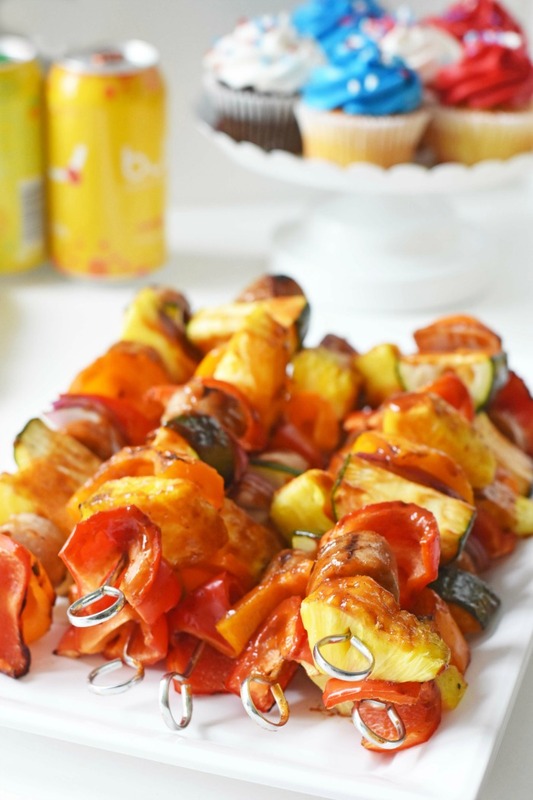 If slightly charred, sweet apple chicken sausage, juicy pineapple, smoky peppers, onions, and zucchini make your taste buds dance, then this is the perfect shish kabob combo for you! Pair these gorgeous produce staples with some the lower fat, al fresco Chicken Sweet Apple Sausage and you got one heck of a meal! 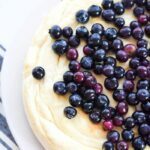 I love the little bits of sweet apple in each bite and the fact that it is pre-cooked! 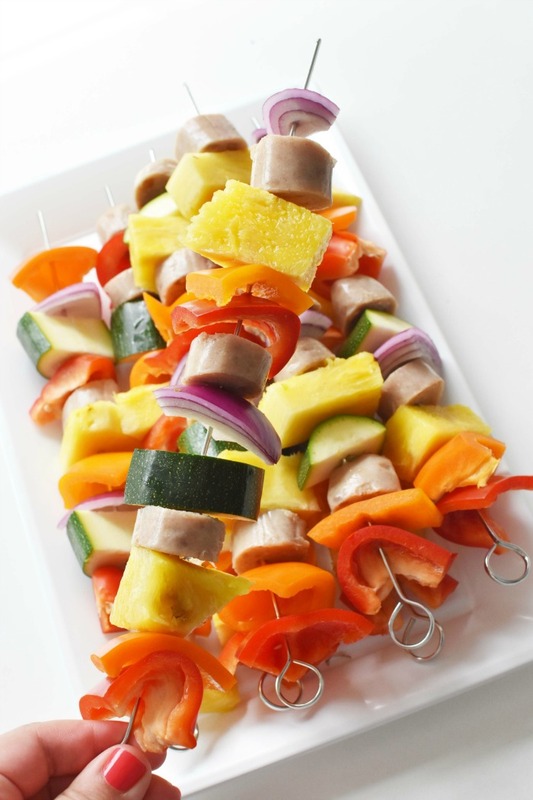 It makes assembling these Grilled BBQ Chicken Sausage Kabobs with Pineapple and Veggies so much easier! 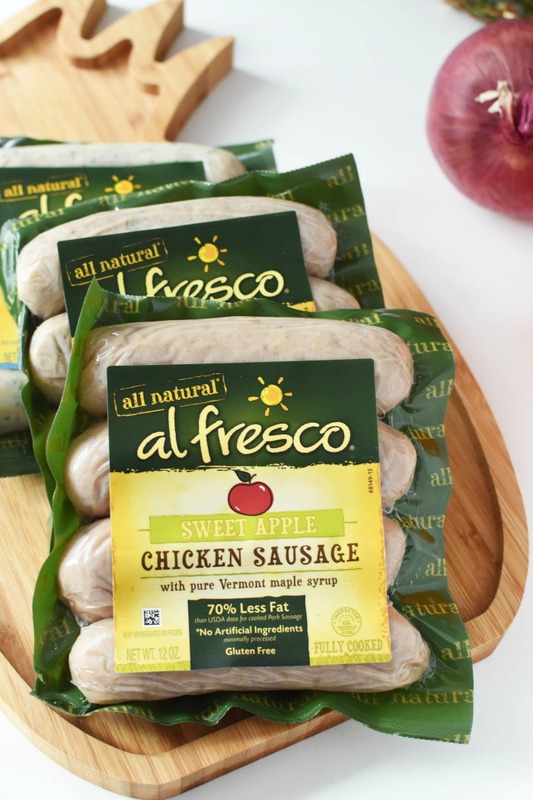 If you haven’t tried al fresco Sweet Apple Chicken Sausage you should! 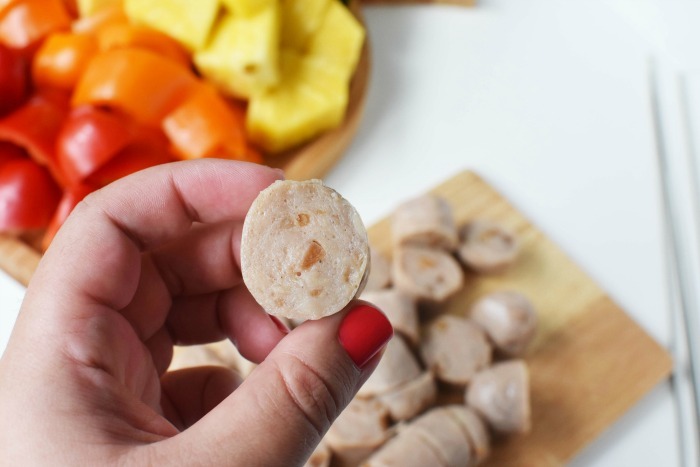 It contains 70% less fat than pork sausage (30% less sodium), is gluten-free, and made with lean, skinless chicken meat. 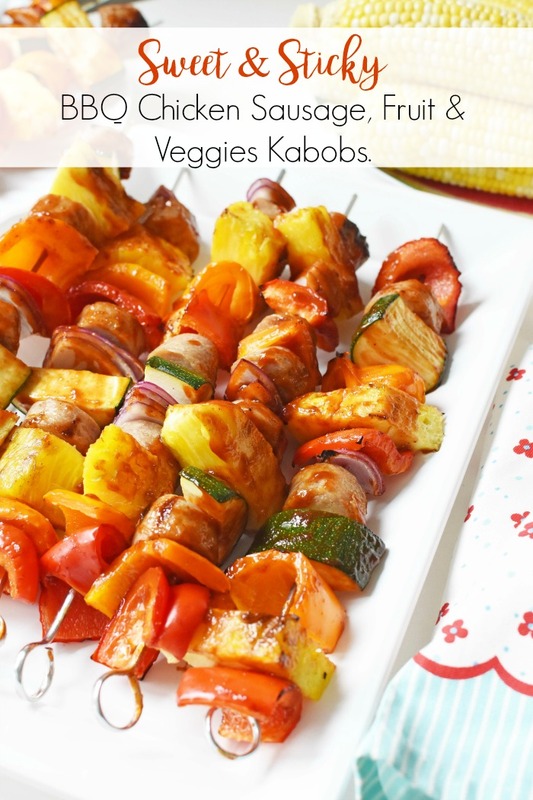 The possibilities of meal creation are really endless, but since summer is all about the grill, I wanted to feature these shish kabobs. Assembling shish kabobs is actually really fun! 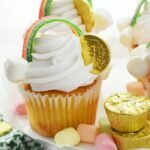 I tried my hardest to stick to a rainbow theme, but towards the ends got a little limited to what was left. Lots of these produce items can be swapped for others. Perhaps you might even have some of them readily available in your own garden? 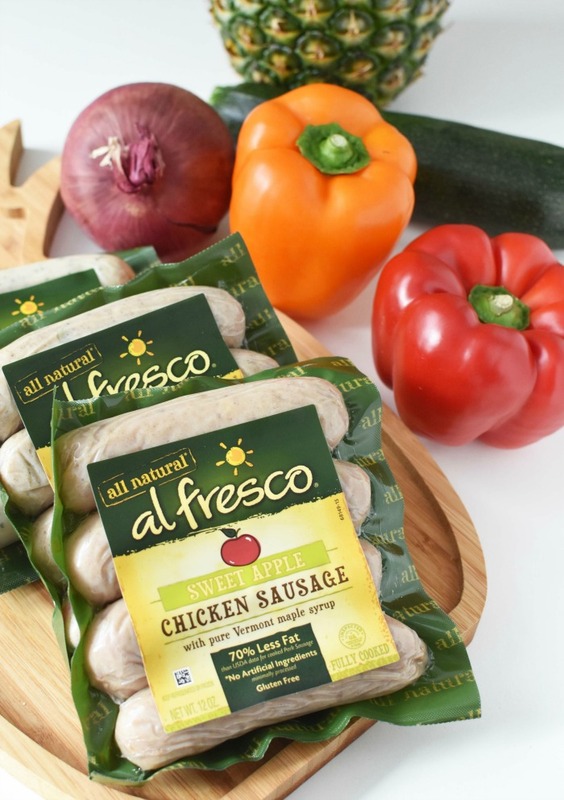 You can find al fresco Chicken Sausage at your local grocer! Check their store locator tool to see which varieties are closest to you! 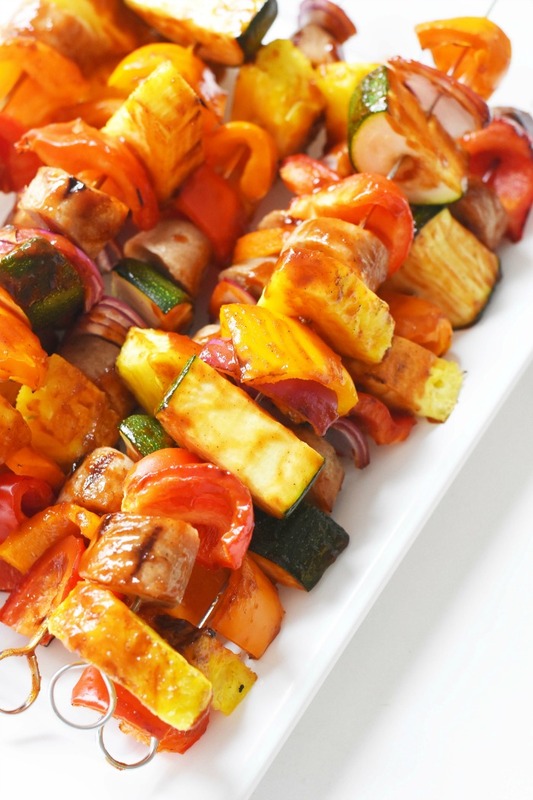 A sweet & savory shish kabob recipe that features the perfect balance of flavor. 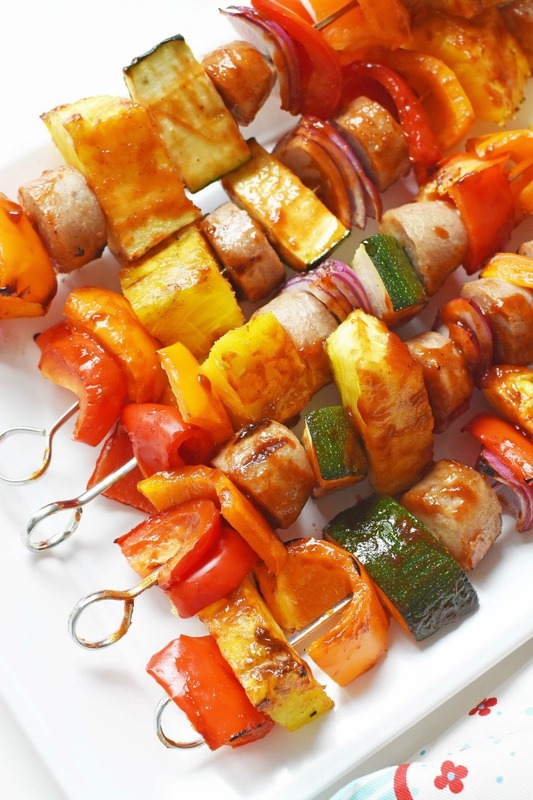 These lower fat kabobs are easy to make and make for the ideal grilled meal. Heat grill to 400 degrees f. Using metal grilling skewers for kabobs, layer each piece of produce so that there 3-4 pieces of sausage per kabab. I tried to make mine in the color of the rainbow. Grill for 2 mins on each side. 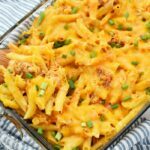 You do not want these to burn so I suggest going lightly since the chicken sausage is pre-cooked. Then, for the last 2 minutes baste with BBQ sauce, and THEN cook for 1 minute each side. To make sure the veggies were the perfect texture, I allowed these to sit in the grill with residual heat for an additional 5 minutes. 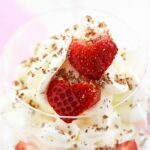 Enjoy with some fixings like corn, and watermelon. I wish I was able to get al fresco chicken sausages up here. There is such a great variety of flavors. 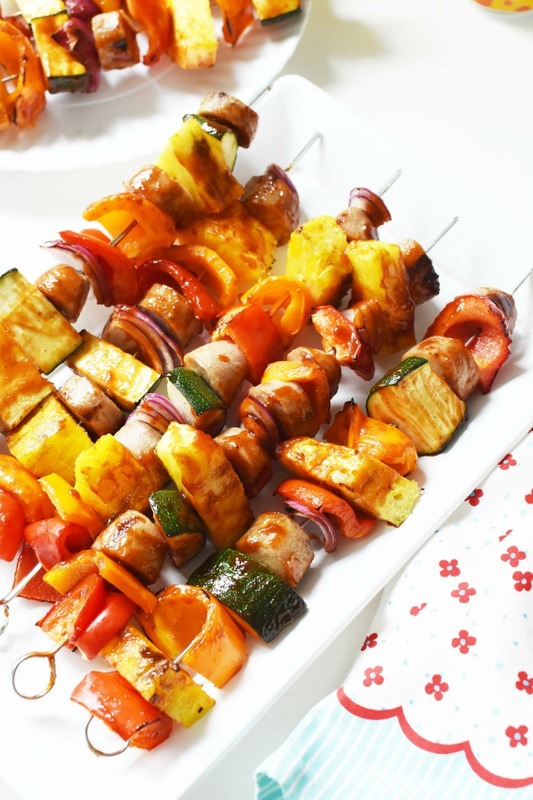 Your kabobs look delicious. I have had this sausage before. Unfortunately my family did not like it. 🙁 I like how you prepared it as a kabob, that sounds really tasty! I love chicken sausage! I’ve never used it with barbecue sauce, though. Can’t wait to try it! Not sure if it’s the same brand, but we’ve been getting a wonderful chicken sausage at Sam’s Club. This is a neat way to cook it up! 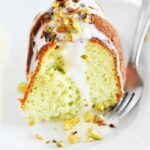 That is one of the most delicious kabob recipes I’ve seen. I really like their brand of sausage – I typically buy it!